Only oxygen is more essential than water in sustaining the life of all living organisms. Human beings can live for several weeks without food, but only a few days without water. The quality of your tissues, their performance, and their resistance to disease and injury are linked to the quality and quantity of water you drink. Experts agree that in order to maintain optimum health one needs to drink 8-10 glasses of water per day. The daily cleansing of wastes from each cell, the flushing of the alimentary canal and the purifying of the blood are all dependent on our water consumption. According to scientists from the World Health Organization (WHO) and the National Cancer Institute (NCI), it has been estimated that between 60 to 80 percent of all cancer is caused by chemicals in the air we breathe, the food we eat, and the water we drink. The NCI expressed concern over 20 years ago that increases in carcinogens in water and our inability to remove them could result in serious exposure of the general population. 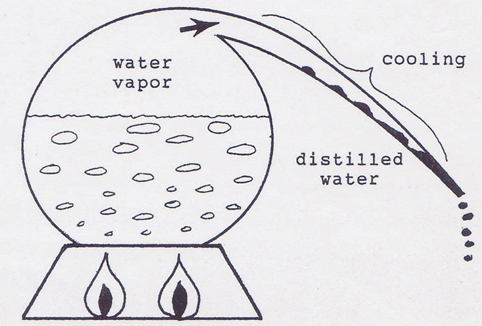 Distilled water is water which has been heated to the boiling point so that impurities are separated from the water which itself becomes vapor or steam. It is then condensed back into pure liquid form. The impurities remain in the residue which is simply thrown away. Distilled water contains no solids, minerals or trace elements, and has no taste. Distillation removes the debris, bacteria, and other contaminants. There are two forms of minerals, organic and inorganic. Inorganic minerals refers to non-vegetable or non-animal matter, i.e. not living. This includes carbonate and lime compounds, calcium, iron and magnesium. Because these components are non-living, our bodies can no make use of these minerals and our cells reject them. The result of ingesting these minerals is an accumulation of debris in our bodies. Organic minerals living and are found in vegetables, fruit, seeds, grains, meats, and nuts. These are easily assimilated by our cells and are essential for good health. If your rely on water as the source of your required minerals, you are sadly lacking. T he minerals in water are inorganic, and the body cannot make use of them. The body continually assimilates the much needed minerals from the food we eat. Does distilled water rob the body of essential minerals? No, this is physiologically impossible. Some have been lead to believe that because distilled water is so pure, it will leach healthy minerals and trace elements from the body. In our bodies distilled water cleans out our impurities and replenishes the essential nutrient required for human life: pure, clean, healthy water. Our cells use the organic minerals for body growth and maintenance; however, the impurities that the body cannot make us of are flushed out with distilled water. 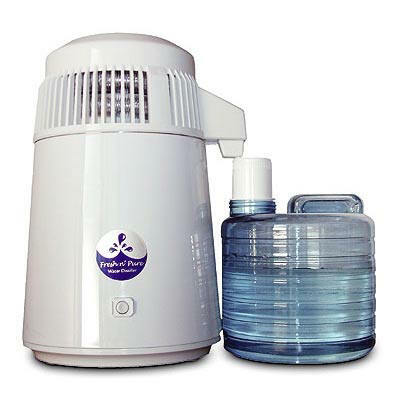 Distilled water flushes out all the inorganic minerals and pollutants which would otherwise be retained in the body and accumulate in vital organs such as the liver, kidneys, and intestines. These minerals and pollutants are gradually increased by drinking impure water. A continuous or prolonged exposure to these minerals and pollutants may cause carcinogens to form within tissues. The cancer may only manifest itself months, years or even decades after such contacts have ceased. And often the causative agents may have totally disappeared from the tissues. It has become apparent that pollution and contamination exist within our drinking water. With the amount of sewage dumped into drinking water sources, many water borne diseases are present in the so-called “treated” drinking water. This leaves our bodies vulnerable to infection and disease.